Mattel and clothing designers, The Blods, just announced their new designer release of Pink Diamond Barbie. 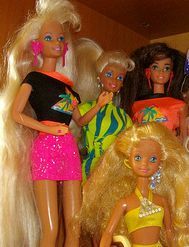 The Blods normally design clothes for celebrities such as Beyonce and Katy Perry, but they shrunk down their designs to accommodate for a much smaller model, Barbie. The dress was entirely handmade by The Blods themselves. Barbie’s look is fully complete including a faux fur coat, pink stud earrings, sparkly ring, fuchsia gem dress and certificate of authenticity. Appraisers value the doll at around $15,000, but there is no telling how much it will sell for at auction. Despite this outrageous net worth of the Barbie, it is not the most expensive doll ever sold. In 2012 a doll sold at auction for $300,000 because of its diamond choker. It is obvious that this particular version of the doll will not be available in stores, only to private buyers. However, there is a replicate version available online at BarbieCollector.com for $125, but it is on backorder until Christmas. So, if your little princess is waiting ever so impatiently to receive her pink jeweled Barbie, order it now so she can have it in time for Santa to bring it to her before it’s too late! All proceeds go to the charity fund of the MAC AIDS organization. Torrisi, Lauren. "Designers Auction $15,000 Pink Diamond Barbie." ABC News. ABC News Network, n.d. Web. 29 Oct. 2012. <http://abcnews.go.com/blogs/entertainment/2012/09/designers-auction-15000-pink-diamond-barbie/>. "Celebrate 50 Years of Barbie." Celebrate 50 Years of Barbie. N.p., n.d. Web. 29 Oct. 2012. <http://barbiestyle.barbie.com/news.aspx>.